The Calabash tree (Crescentia cujete) is a plant native to Central and South America.It belongs to the family Bignoniaceae. It is a small tree of multiple uses, originating from tropical America, now widely distributed in the tropics. The calabash tree grows to 30 feet often with multiple trunks. The rangy twisting branches have simple elliptical leaves clustered at the nodes. The greenish-yellow flowers are marked with purple veins. The flowers arise from the trunk or main branches and appear from May through January. The woody fruit, botanically a capsule, is elliptic, ovate, or spherical and may grow to 10 inches in diameter. The fruit takes up to seven months to ripen. Fibres from the calabash tree were twisted into twine and ropes. The hard wood made tools and tool handles. The split wood was woven for sturdy baskets. But it was the calabash’s gourd-like fruit that made the plant truly useful. Large calabashes were used as bowls and, peculiarly, to disguise the heads of hunters. In Suriname’s traditional medicine, the fruit pulp is used for respiratory problems such as asthma. A fruit decoction is taken orally to treat diarrhoea, stomach ache, colds, bronchitis, cough, asthma, and urethritis. The IIIrd B.Sc Botany Students Mr. Leela Prasad, Jacob Samuel Raj and Ms. Anupama participated in the Inter Departmental Quiz Competitions organized by the Dept of BBA, Andhra Loyola College on 22-09-2012. The students bagged the first prize in the Competitions. Congratulations to all students on behalf of the Department. The Department of the Botany has displayed the 21 verities of Vinayaka patri which were used in the Pooja. All these plants are medicinally important. The main aim of displaying these plants was to bring Awareness and to explain the importance the plants.These plants kill the microbes and purify the water resources during the rainy season. The students distributed the pamphlets representing the details and the importance of patri, pamphlets were also given to students to educate them about the Eco -Friendly Vinayaka celebrations. The day of free ideal distribution had added the hand for saving the Nature. 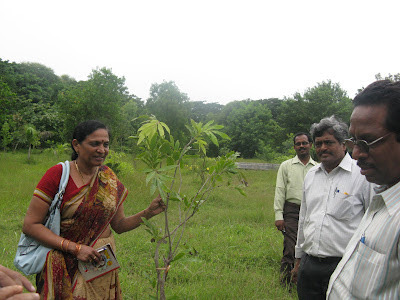 On 18th Sep-2012 the Students and Dr. B. Siva Kumari, Head, Department of Botany in collaboration with A.P. Pollution Control Board distributed MATTI VINAYAKA STATUES’ to the public in the evening at 3.30 p.m to 6.00 p.m at N.T.R circle, Patamata. The A.P. Pollution Control Board Zonal officer, Vijayawada, Mr. A. Vijay Kumar has distributed the idols along with the students and his Colleagues. This distribution grabbed the attention of all the people who were passing through the streets. The students had not only distributed them but majorly focused on the saving of the Nature and protested and educated the Citizens not to opt for the plaster of paris and enamel paints which lead to the extension of the living beings in the water also caused the death of organisms. The APPCB Officer Mr. A. Vijaya Kumar has inaugurated the programme by distrubuting Clay idols to the public. All the members of APPCB were present in this programme. 500 Idols distributed . It has sensitized the people to think and feel for the Mother earth. It had a strong effect on the people from the small age to elders. people had joined the students in support to the option for the Matti Vinayakas in reducing the pollutants. It has been unfolding since couple of years the importance of ensuring Vinayaka Chavithi with eco friendly idols. And it is the senior citizens responsibility to make the generations purse the importance of the traditions and rituals which has been passed on to us, it is with these concerns of these two issues that the A.P Pollution Control Board has put forth the proposal of ensuring the people of Vijayawada the meaning of using 21 patris being used in Vinayaka puja and also distributed clay idols of vinayaka to the public to expand the realm of knowledge of Environmental pollution due to chemicals used in making Ganapthis. The students of III B.Sc and Botany Department staff were actively participated in this programme. The programme ended with the Awareness talk by the Zonal Officer, APPCB. POSTER PRESENTATION COMPETITIONS and a guest lecture on Conservation of Biodiversity. ON THE EVE OF WORLD NATURE CONSERVATION DAY -28-07-2014. Total 65 students participated in this event, Ms. V. Kavitha, Mr. P. Srinivasa Rao and Mr. K.Balachandra acted as judges to select best three posters. GUEST LECTURE: ON THE EVE OF WORLD NATURE CONSERVATION DAY on 28-07-2014 NGC Organized a guest lecture on Conservation of Biodiversity.Sri. The guest lecture began with the words of welcome by Rev. Fr. 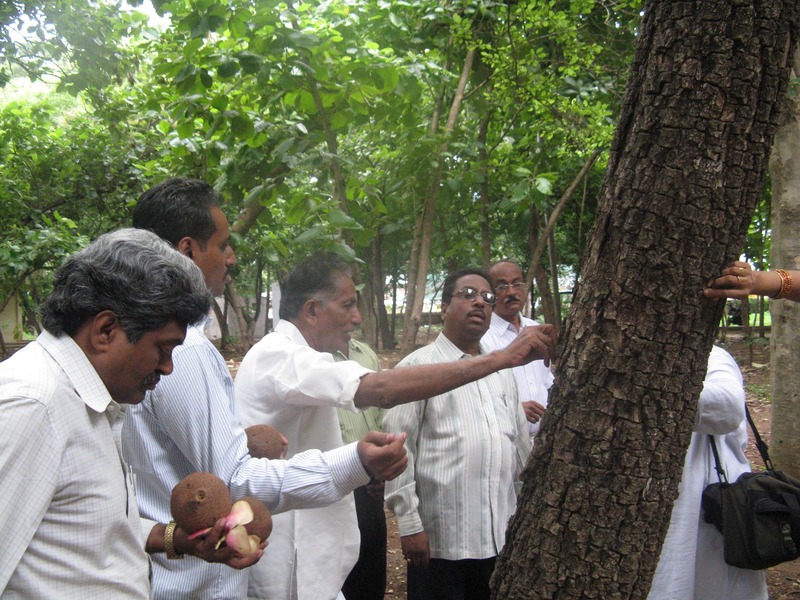 P. Anil Kumar, Vice- Principal of Andhra Loyola College, He explained the importance of the nature through a story which made students to understand the value of the nature, he welcomed all the Guests, Staff and Students. 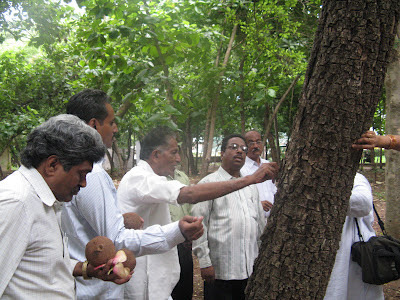 K. Ashok Kumar, D.F.O, D.F.C, Social Forestry, Krishna Dt was the guest speaker. He emphasized on “Usage” and “Utilization” of natural resources and human responsibility for conservation of Nature.K. Ashok Kumar, emphasized on the -Biological diversity - or biodiversity - is a term we use to describe the variety of life on Earth. It refers to the wide variety of ecosystems and living organisms: animals, plants, their habitats and their genes. which is for the Environmental Awareness for all the Departments of Andhra Loyola College.The A.P. Pollution Control Board has given a chance to the students to picturise the world, especially the world of the today. 100 students participated in this competition; the students were triggered and came up with different views for saving the Nature by their artistic ability. Ms. M. Glory, Lecturer in Microbiology was the judge to this drawing competition, she gave complements and feed back. The winners were declared by the judge. The winners were given prizes in the seminar by the Guest of honor Mr. Sastry, Regional Officer, APPCB. It was the day which has gathered the innovative views of the students on making the Environment a clean place. Climate Change affects us all, including you! STRATEGIES THAT YOU WOULD IMPLEMENT IF YOU ARE GIVEN A CHANCE TO PROTECT ENVIRONMENT. 50 students have participated in this program. This competition was an Awareness bringing and also brought out the different views of the students and their plans. The students had mainly focused on the last two topics. Dr. T. Sri Kumar was the judge to the essay writing competitions, the complements and feed back were also given. He said that most of the students have focused on cleanliness and the thoughts expressed by the students were very practical, creative and thought provoking. The winners were given prizes in the seminar by the Guest of honor Mr. A. Vijaya Kumar, Zonal Officer, APPCB. He also shared his views on the topics and encouraged the students. The Department of Botany organized a Slogan Writing Competition in association with the A.P. 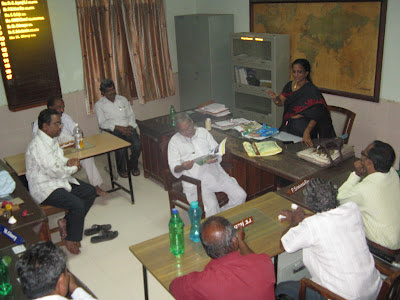 Pollution Control Board on 11th September 2012, on the topic ‘SAVE NATURE’ to impart Environmental Awareness for all the Departments of Andhra Loyola College. In this programme 150 students participated and involved enthusiastically. The program went on well and excellent slogans have been given by the students very identically. Here are some Environment slogans and Sayings for a wide variety of environmental issues and topics. Each and Every one of us can make a difference to help save the environment. We all can learn to reduce, reuse and recycle so Earth’s resources are not depleted, pollution doesn't trash the planet, and harmful CO2 isn't let out in the air causing Global Warming. We need to love and cherish Mother Nature; after all we only have one planet. Each one teach one how to plant one . Dr. T. Sri Kumar judged the slogans. These Slogans writing competitions prizes were distributed by the Dr. A. Ravi Kumar, Professor, Siddhartha Medical College. He has delivered his speech on the topic ‘Environmental Awareness’ he explained the causes and remedies of the Pollution. Today studies are more Inter-Disciplinary . No science can be treated in isolation and hence is also Botany. Botany is the study of plants.The flora has imbibed itself in the supporting elements of life.It is with the critical thought of giving life to all other branches of science we would like to bring the importance of flora around us for our existence. The Department Botany would like to bring the awareness among our students belonging to various Departments regarding the importance of Medicinal plants and their uses.The medicinal value of plants and it's enhancements in drug development is to be brought into the lime light. on 07-09-2012 this programme was inaugurated by Rev.Fr. 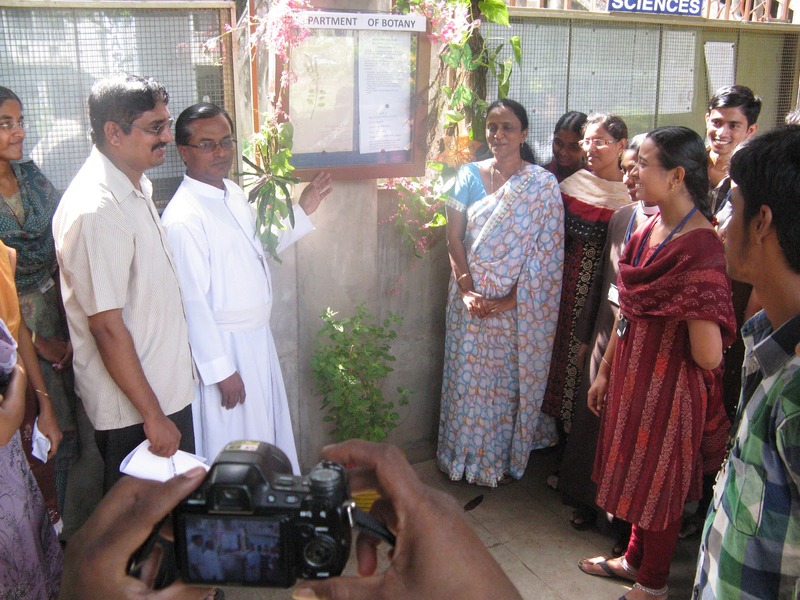 Corespondent Dr. A. Francis Xavier, S.J and Vice- Principal Rev.Fr. 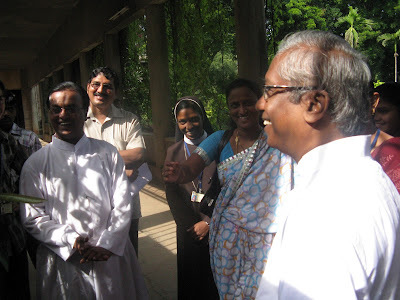 S. Raju, S.J. Fr. Correspondent, Fr. Vice- Principal inaugurating the programme. The drugs are therapeutic agents for various types of diseases.The subject of drug is as old as Disease. People often use the crude drugs to cure different types of ailments. Today different types plants are used in the drug extraction, There fore there is a need to learn about the plants and drugs. 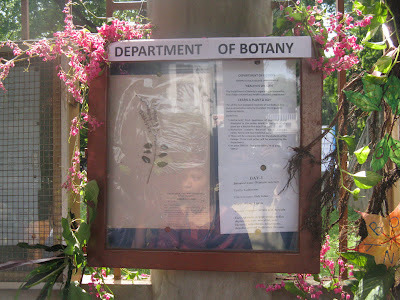 So on behalf of Botany Department we would like to bring awareness among the students of our College. Hence We display one plant daily in the notice board, it consists of Scientific name, common name and its medicinal importance. Staff and students explaining the theme of the programme to Fr. Vice-Principal. This is rare, exotic fruit it is commonly known as bilimbi or tree sorrel, native of Thailand and Singapore. In India it is usually found in gardens, generally it prefers warmest conditions. It is closely allied to the carambola, but quite different in appearance, manner of fruiting, flavor and uses. 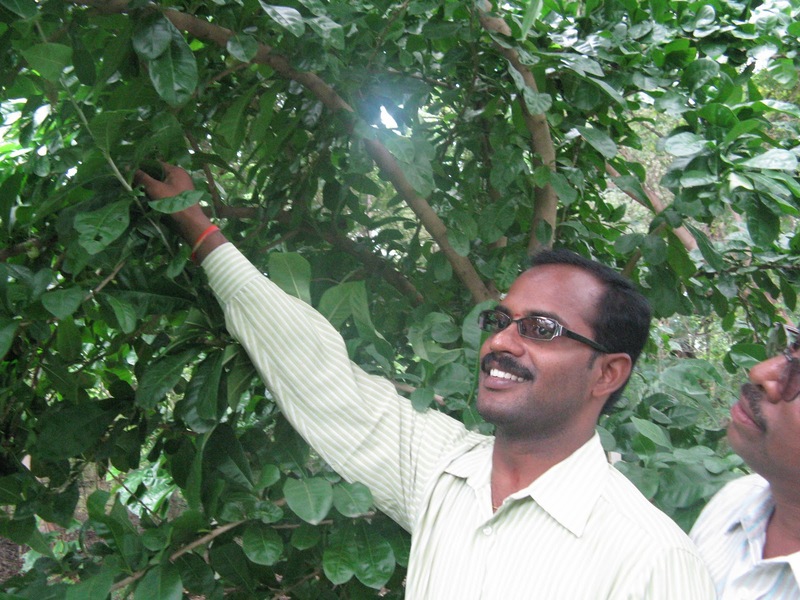 The bilimbi leaves and taste of fruits are quite similar to goose berry but these plants are not related. The tree is very attractive, reaches up to 35ft height, purplish yellow flowers born on trunks in clusters. It produces thick green colored bunches of fruits resembling small cucumbers.The fruits are too acid for eating raw, they prepared as a relish which is served with rice, fish and meat.in cooking it is used in the place of tamarind. Leaves : Rheumatism,Mumps,Skin eruptions and venereal diseases. Flower: Thrush, cold and cough. This plant has less number of species, research is going on to confirm effectiveness of the plant parts.